People join online dating sites for many reasons: To find an activity partner, a friend, a date, a long-term relationship, marriage, or marriage and children. Some sites (JDate being one of them) are even nice enough to lay out all of these choices side-by-side for us. 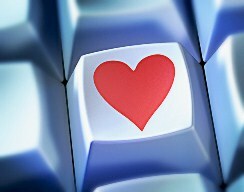 All it takes is the click of a button or two to list what we’d like to find in our online dating adventure. Curiously enough, “pen pal” is not an option. In fact, nothing of the sort is listed – not “letter-writer,” “someone to keep me occupied at work,” or “e-mail buddy.” Nope – it’s just not a choice. Why? Because people do not join online dating sites to simply e-mail back and forth. People are looking to form a real relationship, not an e-lationship. The scenario always starts out the same. As women, we find someone good-looking who fits the bulk of our criteria. We send a short and sweet e-mail out into the ether just hoping for a response… and to our delight, we get one. We write a witty response back, spell checking twice and editing a little more. Finally, we send it off, waiting the requisite few hours or even a day just to make sure it doesn’t look like we’ve been sitting by our computer. Sometimes we get nothing back again (so annoying! ), and sometimes we do… time to celebrate! So, we e-mail back, sharing information about ourselves, our jobs, and our lives outside of the confines of the dating site. And lo and behold, we keep getting responses. But response after response, nothing leads to a date request. When it comes to online dating, the best way to play your cards is to ask someone out after just a few e-mails back and forth. Chemistry is hard to gauge over e-mail, so a few extra e-mails won’t make or break it. The best way to see if there’s any spark is to meet in person, and the sooner the better. If you plan the first date quickly and like each other, that’s great – you’ll have more time to spend together! If you don’t have that connection, you can move on without investing more of your time. In fact, I don’t even recommend talking on the phone before a date. Someone might be great on the phone and a dud in person or a bore on the phone and fabulous in person. The point is that you never know whether you’ll have chemistry (which I call the “wild card”) until you actually meet, and no number of e-mails will change that. For men, it’s never too forward to ask someone out for a drink or coffee after one or two e-mails. (Remember – no dinner on a first online date.) If a woman responds to your e-mail or reaches out to you on her own, she’s probably interested enough to meet in person. But she’ll likely get a bit restless after about the fourth or fifth e-mail with no date in sight, so it’s best to lock in the date before that happens. E-mails are nice, but in the end, we’re looking for something real, someone real, and not just some words on a page, or an e-lationship.